I found it to be a great relief. Apparently, judging by the thumbs-up/thumbs-down, about 1% of those who viewed this didn’t like it. November 3rd, 2016 Syria Part 1 Peace Action Forum from Public Takeover on Vimeo. 20008 1124 from Public Takeover on Vimeo. Everybody’s stupefied. Even President Obama seems to have fallen off a cliff. Besides, Trump is essentially such a bully and unstable megalomaniac, that none of us can really believe so many Americans voted for him for President. Is it a nightmare? To top it off, he’s a Republican, just like the House and Senate, and soon to be, the Supreme Court. Ever been hit over the head with a tuna? They said it was just a populist wave, but Trump suspiciously won FL, NC, PA, and WI each by 1%. These are four states where Clinton was comfortably up in the polls before November 8th, then surprisingly lost the tally on election day. I haven’t sorted out the Exit Polls yet, but the usual rumors abound–that the difference between the vote tally and exit polls are outside the margin of error in those four states. Oh, and Clinton won only in counties in Wisconsin that use paper ballots only. She only lost in counties with touch screens. There was a petition going around to audit the election results, but we know how those things go: usually squeezed to death between rock-hard political pressures. The important thing is, Trump is a minority president-elect. His percentages are worse than W’s, so he’s going to have an even harder time getting anywhere with the public, even with a slam-dunk Congress. So, there’s another scenario for a weak president to start a war in order to gain some “political capital.” Russia seems to be off the table. China? Unlikely. I’m guessing predominantly Muslim country with strategic location and natural resources. It has to be a country that can’t fight back, too, because those are the only ones we pick on. Indonesia? Somalia? Nigeria? Once the Juggernaut is rolling, it’s hard to stop, so we have to get out there ahead of the propaganda machine and silence the war drums before everybody starts dancing to them. We could organize phone banks or something where we give citizens scripts to call their Reps and Senators. We can also hold vigils and demonstrations. But the thing that we really need to focus on is the television medium. Our media are censored. The radio, newspapers and television do not cover the details of the daily struggle of poor and middle class Americans. There is very little news and viewpoint on the finer workings of Congress, not to mention state and local governments. Democracy depends on this news coverage. In terms of the military, most citizens have no idea who’s running things, how much money they’re spending, where and on what they’re spending it, and how does that affect the average voter. We really want to find a way to embarrass or compel these media companies to serve the public interest. 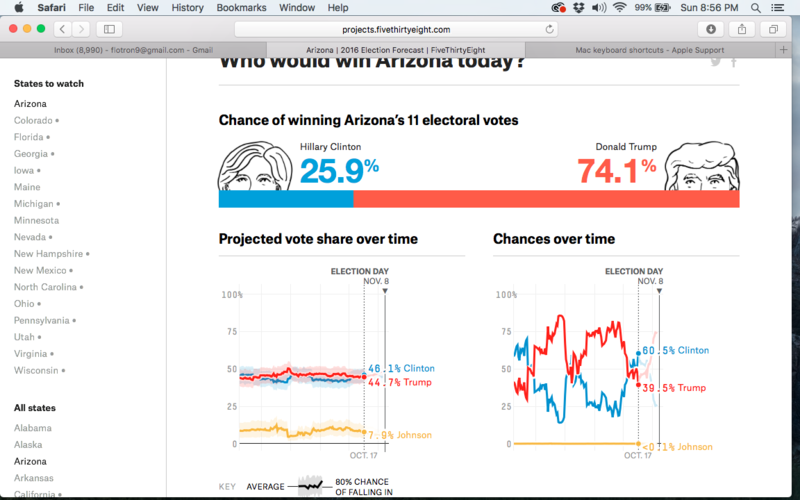 Here is a screenshot from Nate Silver’s 538 Blog pertaining to the state of Arizona on the 17th of October, 2016. Three weeks before election day, Clinton has a clear majority of the vote, and Silver gave her a 65% chance of winning the state. Today, Trump is favored to with the state by a 75% chance. What happened in the last three weeks to flip Arizona (and about 5 other key states)? FBI director James Comey wrote his letter to Congress about reopening Clinton’s email investigation. 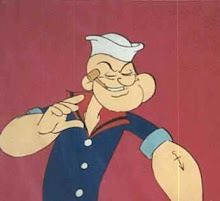 It was a total red herring, a political stunt. I wish … but the Times is exaggerating. Certainly, Sanders didn’t have much to celebrate either. There’s no way the Clinton campaign is crestfallen about winning Iowa, even by a small margin. I haven’t posted anything in here for months. The Vigil is still going on. We protest war, defense spending, skewed budget priorities. We need singers, musicians, dramatists to join us. 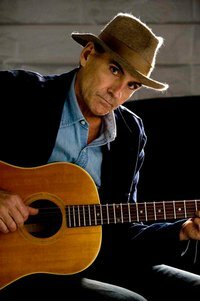 I’ve rediscovered James Taylor. I wrote him off — with justification — in the eighties. But I didn’t realize that he came back and recovered his quality and form. Also, he’s still touring and making public appearances and, will, hopefully, record some more original work. His stature as an American musician is second-to-none, and as a cultural icon, he’s approaching the top, too. I confess I haven’t listened to anything new that he’s recorded since 1998. He has done at least one album of new stuff, plus a couple of live albums. Still, I’m hoping he makes it into the studio one more time… at least. The guy is amazing.